Valletta is a fascinating city where you can spend an amazing couple of days surrounding by history, amazing baroque architecture, ancient fortresses, breathtaking cathedrals and some very fascinating museums. In fact, Valletta is one of the most concentrated historic cities in the world as it contains more than 300 monuments within a small portion of land, surrounded by fortresses and defensive ramparts. No wonder it is often called an open-air museum. Valletta is such an important city that, through times, it has been given titles like The Fortress City, Umilissima Civitas Valletta (The Most Humble City of Valletta), “a city built by gentlemen for gentlemen”, Masterpiece of the Baroque, European Art City and finally, in 1980, was considered one of UNESCO’s World Heritage sites in Malta. Since UNESCO’s recognition of Valletta, the city has flourished in terms of building and heritage conservation, presenting itself today as a beautiful and unique Mediterranean travel destination. A visit to the capital city of Valletta is a trip to the past where you travel back time when the Crusaders Knights of Malta were still protecting the city. The history of Valletta is obviously closely related to the History of Malta. When the Knights of St John of Jerusalem arrived in Malta in 1530, they settled in Birgu (later Vittoriosa) one of the Three Cities of Malta. 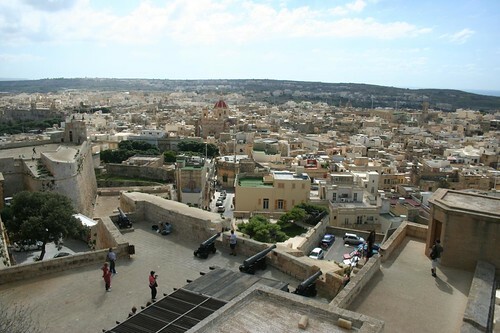 Birgu was protected by the small watch tower of St Elmo, which stood on Mount Sceberras, then converted into Fort St Elmo. This fort really came to prove its strategic position in the defeat of Suleiman, in the Great Siege of 1565, and the Knights realised that was the defensive point capable of keeping the Order safe in the island of Malta. With the mighty victory over the Muslims, the Knights would get essential financial aid from the grateful Pope Pius V and Philip II of Spain to build the city of Valletta, whose name was given after Grand Master La Valette, the hero of the Great Siege. The mastermind behind the design of the city of Valletta was Francesco Laparelli, a military engineer, later replaced by his assistant Gerolamo Cassar. Laparelli could then create the perfect fortress city, starting from scratch on the arid rock of Mount Sceberras peninsula, overseeing the two deep harbours of Marsamxett and Grand Harbour. When you visit Valletta you will not consider it a modern city but it was one of the first examples of town planning based on a grid pattern of streets. Here are some important features and advances in the planning and construction of Valletta with its strategic defence in mind. Designed in an almost uniform grid, Valletta’s streets fall steeply as you get closer to the extremity of the peninsula giving defenders the best position. The same grid let fresh air from the two harbours circulate easily in the narrow streets, keeping the city cool. Strong bastions and deep moats were built. The stairs in some streets in Valletta are big enough to allow knights in heavy armour to climb the steps. Innovations like pipes for fresh water and sanitation was provided for knights, their servants and trades people in Valletta. 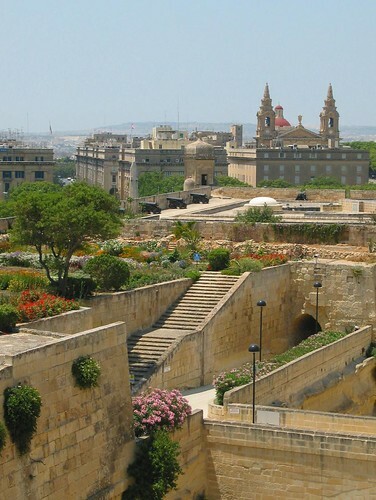 The construction of Valletta started in 1566 and lasted only 15 years! This was the time it took to build the city, its bastions, forts and cathedral. This is even more impressive considering that the rocky Mount Sceberras was not an easy location and substantial levelling was needed. La Valette died in 1568, before the city was completed. By 1571, Valletta was already capable of receiving its first inhabitants, the Knights transfered from Birgu to their new capital. Major early buildings were constructed like the Cathedral of St John, the Sacra Infermeria, the Auberges or Inns of Residence of the Knights and the Magisterial Palace. When the 16th century began, Valletta was already the size of a city and the Maltese people started moving to the safety of its walls from all over the island of Malta. The Order of the Knights of St John moved most of its structures to the new capital of Malta but the Three Cities maintained their economic importance because of their docks. Mdina, the old medieval capital of Malta stagnated but remained home to the Maltese nobility, descendant of the Sicilian and Spanish overlords. Some centuries later, Valletta’s history met World War II, suffering heavy bombing. But the partly destroyed Maltese capital survived, together with the Knights’ masterpiece, St John’s Cathedral. In the years that followed WWII, Valletta’s citizens moved out to more modern houses in other villages or cities, living the capital with only 9,000 inhabitants. 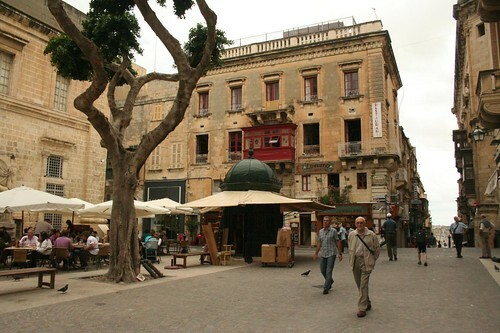 Recently, the opposite has been happening, with Maltese moving in, proud of the architecture of their capital. Valletta is the smallest capital of the European Union and the major commercial and financial centre of Malta. Being one of the most concentrated historic areas in the world, it is an attractive destination for tourists that want to go back in time inside the walls of Valletta visiting and photographing streets, churches, palaces, statues, niches, fountains, gardens, coats of arms and other art works. On the main streets of Valletta you will find some of the best shopping in Malta inside large international brand shops for fashion, music, jewelery, etc. On the narrow side streets try the local products shops or taste the delicious food and drink of Malta at the small picturesque cafés and wine bars. Malta’s Grand Harbour is a must too. Take home both a memory and a photo of the most beautiful harbour in the Mediterranean. At night, the streets get calm and quiet. Take a walk with the dim light and discover another, perhaps even more beautiful, Valletta. Before you plan your travel and get on a plane to Malta, learn about the calendar of festivals and events to see if you’re lucky enough to experience some of the many cultural events that happen in Valletta, from popular ones to internationally acclaimed organisations.